It took some time for Image & Form to make it onto my radar. I hadn’t heard of them until SteamWorld Dig and it wasn’t till after playing that game where I learned they already had released SteamWorld Tower Defense back in 2010. 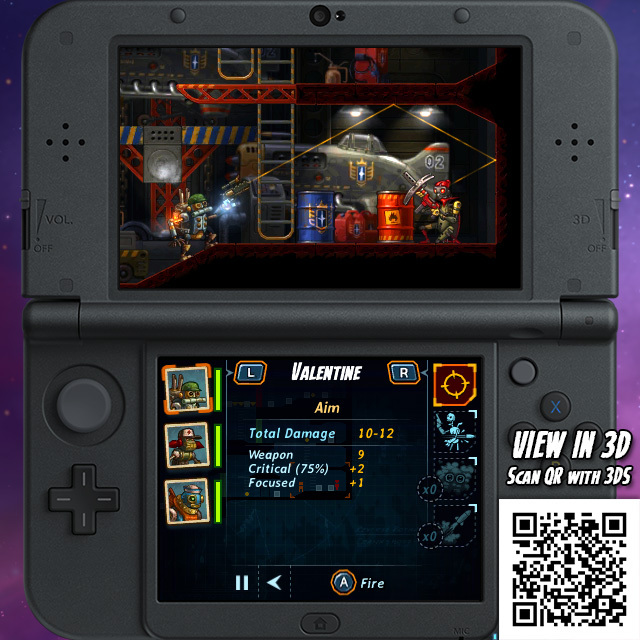 Now the year is 2015 and the world is seeing the release of the third game in the SteamWorld line, SteamWorld Heist. I had a significant amount of excitement leading up to this release considering how much I dug SteamWorld Dig but I also had some apprehension. I am not well-versed in turn-based strategy gaming and I didn’t quite know what to make of it. After playing through the entirety of the main game, I can safely attest that this game both held up to my hopes and simultaneously shrugged off my fears. The basic premise of the game is that you, Captain Piper Faraday, is a steambot looking to pull a bit of a Robin Hood moment on the Royalists who has been terrorizing other steam-driven robots and hoarding gallons. Gallons are essentially water jugs which are used as cash in this world because in the world of Cowbots, steam is king. While Faraday is a smuggler/pirate type, you’ll end up recruiting many characters over the course of the game. In my first run I ended up with nine playable characters and I believe that might be them all. There’s a slick series of overworlds which are very easy to navigate through. On those maps you’ll find different ships and locations which are in turn either shops or levels or small areas for story-driven moments. Each actual stage takes about 5-15 minutes depending on skill level, experience with the game, and perhaps your particular load out. Your primary goals are set out in front of you and are usually pretty basic. In most cases you need to collect the loot in the level and usually there’s a key piece of loot in particular. However it’s not that easy because the loot isn’t sitting around waiting to be picked up. There are slews of enemies awaiting in the wings but it never feels like so much that it’s overwhelming or unfair. I should mention too that I chose to play on the Regular Difficulty but there’s three more beyond that (Experienced, Veteran, and Elite). There’s even one below that for Casual gamers who may be very new to this kind of gameplay. I appreciated the options in this sense as to me it’s a very Nintendo-thing to do. Accommodating for less experienced gamers while still providing the challenge others might seek is a big plus. The way you tackle the enemies mentioned are through the turn-based strategy aspect of the game. You bust into their ship, fight them, and leave with the loot. Movement is handled with the D-pad which frees the Circle Pad up for camera movement which will become more and more important as the game progresses. Once you’ve got a character in position, it’s time to use a variety of actions to take down enemies. Whether it’s a well aimed bullet or lobbing a grenade over a ledge, this game presented me with a lot of fun problem solving that was almost puzzle-esque in it’s design. Finding the best way to approach enemies and take them out was very rewarding. Don't think you can hide from Capt. Piper Faraday! There are so many different weapons to choose from that everyone will be free to customize their experience. I found myself sticking Faraday with sharpshooter weapons which prevented me from shooting after moving so I had to either shoot or move and could never do both like other characters could. However I appreciated having someone like this on my team as it provided a laser sight for tricky shots and a stronger overall weapon. Finding the right mix of teammates, weapons, and other gear was a fun aspect which never really felt too complicated. I never had the feeling like I wasn’t making the most efficient loadout for myself but yet I still was able to recognize the moments where expressing my freedom of choice might be a wise one. Besides health items, special weapons, and your traditional weaponry, Image & Form decided to make hats a thing too. It’s completely random and the hats don’t affect your stats in the slightest but there’s some pretty comical and awesome ones in the game. I encourage everyone to seek out what you can. You can find them in shops or by shooting them off the heads of enemies. It’s a fun collecting aspect of the game. Customize to your SteamHeart's content! The previously mentioned customized experience is further customized by the randomly generated aspect of the levels. Just as in SteamWorld Dig, the levels are randomly generated except for a select few. These non-random levels were the shops and boss battles primarily. What is actually pretty great about this was that on the occasions where I failed the level (and it happened a few times) I would re-enter it and the layout would be different. This usually helped because I was able to find a better way to tackle the level or I appreciated the new enemy starting placements. The constant variety, both in the levels themselves and the different overall challenges, made for a consistently engaging experience. All this culminates to what made this game work so well for me. It’s the same thing that SteamWorld Dig was so successful at and I’m very pleased that Image & Form was able to take a familiar style and apply it to a completely new kind of gameplay. What makes this game work so well is the ever present rewardingness. Each stage is filled with loot and I recommend you aim to collect it all. At the end of each stage you’ll find that this loot turns into items, weapons, gallons, or something else. Then the experience earned for the stages is applied to your active party members. Their experience meters grow and grow until you hit new rankings which unlock more and more features and skills to your characters. This perpetual reward system makes completing a level very rewarding and brought me the distinct feeling of wanting to play ‘just one more’ before shutting the 3DS for a while. 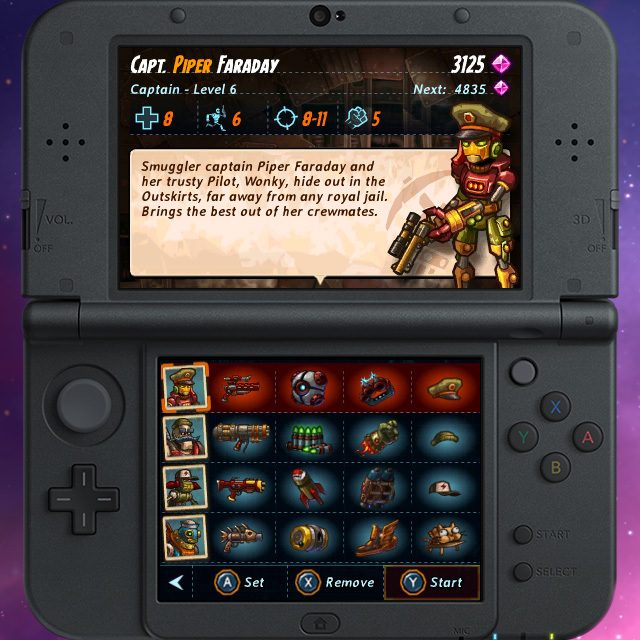 SteamWorld Dig had the same style with it’s ‘collect and sell’ cash-leveling system. I won’t say this premise won’t ever feel old but for the two games I’ve played which feature this, I fully encourage it to continue. I couldn’t put this game down and I blame the excellent way it’s setup for it. The 3DS is brilliant for keeping track of enemies on the map. The Wii U will no doubt have the same benefit. Now this all isn’t to say that there aren’t a few flaws but they’re honestly pretty minor. I understand why the storage system exists but I still found myself pretty frustrated at having to manage my inventory constantly. Almost every level after the first few found me making sure I sold off the stuff I didn’t think I wanted. I would buy every new slot I could but when you have nine characters, there’s just not enough room to give them all their own layouts and items. You can share weapons and gear across all characters at any time so it never was a huge deal but it did kind of corral me into a scenario where I only ever used the same three or four characters because I knew what worked on them and I was fearful of having a bad setup and losing gallons (a punishment for failing a level). I also didn’t really try all of the different unique bonus items because I needed to choose efficiency over experimentation at times. However this isn’t a huge sullen moment for me as it just makes me want to play it again and experiment a lot more. My gripe really is more with the lack of storage initially and with the cumbersome way to sort and organize the gear. When you want to sell items you can sort by relevant and related items but it’s still in a huge list and I always had to be careful I didn’t accidentally sell something I wanted to keep. The other issue I had with the game was that I wanted more from the story. Without spoiling the actual story found within SteamWorld Heist, I appreciated it linking up a little bit to SteamWorld Dig but I feel like I never got more of an explanation overall of the big-picture. It’s possible I missed details though and thus your mileage may vary. The story rides shotgun to the gameplay which, at the core, is the most important (and successful) part of the game. I will attest that the characters are well written and I enjoyed learning what I could from them through the NPCs out in the world and the occasional onboard-the-ship chatter. I managed to pull mere seconds over a 17-hour run in my first playthrough and I felt like that was appropriate. I only failed missions a handful of times but I did replay a few levels for kicks. For example, a late stage called Dazed and Disconnected was incredibly fruitful and playing that level a few times over really helped my amount of on-board gallons. It was appreciated at this stage in the game, allowing me to really stock up and have the right loadout for the final gauntlet. Earlier on I also notably appreciated the Challenge Level called Big Rig Challenge. I went the whole length of it but missing one loot. All my other characters were gone except for Gabriel “Seabrass” Stubb. I ended up grabbing the loot, running through nine guys, escaping with one hit left to go, and they chased me all the way to the exit. I was even eluding turrets. It was incredibly exciting and memorable. That’s what this game is about. Unique turn-based strategy gameplay with a great progression model and pleasing aesthetic in design. The game releases tomorrow on December 10th and I would certainly recommend it to all kinds of gamers. The game releases only on 3DS initially but next year Image & Form plans to release on Wii U, PS4, PSVita, Xbox One, iOS, and of course, Steam. It’s a safe bet to bite now but if the 3DS isn’t your bag, I urge you to get looting in 2016. Thanks for the stellar write-up, Finko. Day 1 for me. Can you remember what size the file was? Turn based you say? Steamworld you say? As a fan of other turn based games, dating back to Worms 2, I am looking forward to this one! 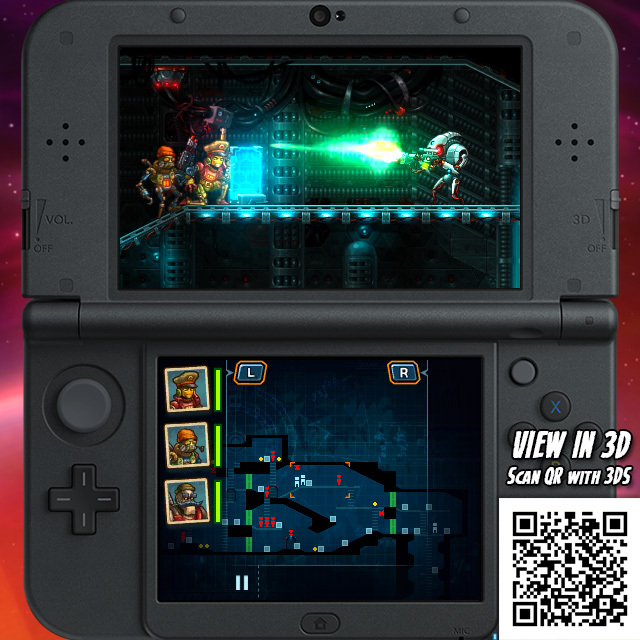 The art style of Steamworld Dig looks to be retained and I'm happy about that. I will definitely give this one a try. Great review! You know, I meant to mention that. There's a funny familiarity to the Worms franchise here. If you liked Worms, you'll love this. Thanks for reading the review. I just checked my system. The file size is 1,427 blocks. Thanks for the kind words by the way. Cannot wait to try this one but unfortunately, I think it'll have to wait, Already playing Xenoblade X and Just Cause 3 and adding a third one to the mix is a bad idea But this review has me really excited for it so great job on that! I'll definitely be buying it day one though cause Image & Form definitely deserves the support. Between the randomly generated levels (which I didn't know about until now) and the multiple difficulty levels, SteamWorld Heist seems like a highly replayable game. That's not even factoring in the customization! Code Name S.T.E.A.M. is one of my favorite games this year, so I'm down for another strategy game that involves steam! Great review, Stephen. I'll most likely download this game tomorrow. By the way, did you play the game primarily in 3D or 2D? Releasing right after Xenoblade X is unfortunate timing for me, but I'll probably grab it up anyway. I played primarily in 2D and probably just to conserve battery life. The 3D was used at times and I did enjoy the subtle use of it when I played it. It just isn't very essential so I kept forgetting to turn it back on. I think you're good either way. It is on sale for the rest of 2015. So that's a bonus incentive. And a free 3DS theme! I should clarify I am definitely playing this eventually, love turn-based strategy and this feels like a really unique one. Just not sure I will get to it right away. Which version do I want. Hmm, on 3DS I could play it on the bus and stuff. It's definitely designed for burst gaming if need be. So it's a great handheld title. Good point! I wonder if I get it too... maybe tomorrow? I would imagine it includes a code on the receipt? I'll be getting this as soon as it goes up so I'll leave a comment in case someone is wondering. Sounds like a winner. I like how it looks a lot less drab than SteamWorld Dig. Want so bad, hmmm..... can I resist until the console version comes out? Probs not. Just download it and for those curious, the free theme is included as a code on your receipt. A bit clunky to not download it automatically but just make sure to check out for it! Nothing on the download receipt I imagine? Oh and the soundtrack in this game... so good! I'd have to go look. Since I nabbed it ahead of release, I don't know if it comes with one. The soundtrack is indeed great. Been listening to Steam Powered Giraffe a lot at work the last two days too. Downloading now. I'm so weak. This game is pretty fun so far! Very cool and unique. Glad I grabbed it right away!